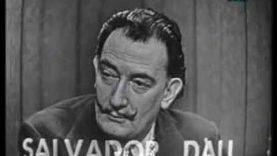 HomeMOVIE & TVSalvador Dali on "What's My Line?" Why are Reality TV Shows So Popular? This ten minute clip is drawn from the famous 1950s game show, and it’s quite surreal. I don’t use the word surreal loosely: the special guest is Salvador Dali.